Update Feb. 10: Leslie Manville just won British Actress of the Year at the London Film Critics’ Circle Awards. Update Jan. 25: Mike Leigh is nominated for an Oscar for Original Screenplay. Update Jan. 18: Another Year is nominated for a BAFTA for Outstanding British Film of the Year, and Leslie Manville for Best Supporting Actress. Every Day, Another Year, film titles like these evoke the oblivious passage of time, and the human experiences that float down the stream of life. The kind of films we would find in art-house cinemas, not your fast-paced action or effects-generated spectacle. Another Year would gratify one’s need for slow ruminations and offer one time to savour the dynamics among characters. The film was on my ‘must-see’ list at the Calgary International Film Festival 2010, which ended last weekend. It had met all my expectations and offered more. What’s more is the excellent performance from a high calibre cast of British actors. Their nuanced portrayals of characters convey emotions unabashedly, but in a deep, restrained and unsentimental manner. That is what makes Another Year so satisfying. I enjoyed it much more than director Mike Leigh’s previous title, equally acclaimed Happy-Go-Lucky (2008), in which Poppy (Sally Hawkins) the happy gal is just a bit too loud and even obnoxious for me. While here in Another Year, Tom and Gerri are the happy couple whose relationship is one of mature, quiet and gentle bliss, compassionate towards themselves and others. Framed in the passing of the four seasons, the film explores the realities of life: ageing, loneliness, death, love, marriage, friendship… Yet the occasional animated and humorous renderings of the characters allow a lighter way of handling the subject matters. 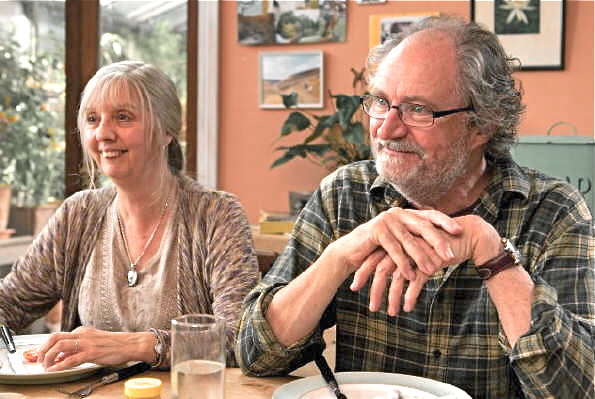 Gerri (Ruth Sheen) and Tom (Jim Broadbent) are a happily married couple living in London. In the midst of the bustling city, they have their own plot of land close by their home where they work hard to grow vegetables. They bring home fresh produce to cook healthy meals and entertain guests. Their vegetable garden is an apt metaphor for the love they cultivate in their relationship despite the busyness of everyday life. Tom is a geologist and Gerri a counsellor in a medical office. If there’s any pun intended here with their names, it would be for the very opposite effect that they are a harmonious pair whose relationship has attracted those less happy to cling on for stability and support. Their usual dinner guest is Gerri’s office administrator Mary (Lesley Manville). A single, middle-aged woman, emotionally fragile, alcohol dependent, and desperately seeking love and companionship. Her male version is Tom’s long time friend Ken (Peter Wight), equally miserable. A heavy smoker and drinker, Ken’s physical health mirrors his emotional state. But why Tom and Gerri gather such damaged and dependent friends the film does not explain. What we do see is a most gracious couple extending their lives to them. Through their interactions, we see the contrast. While we admire the almost perfect marriage, we ache for the singles, sad and lonely… as we see them in this film. I trust the director is making a specific rendering and not a generalization on singlehood. The contented Poppy (Sally Hawkins) in Happy-Go-Lucky (2008) is the best spokesperson for the single league. Tom and Gerri have an adult son Carl (Martin Savage) who frequently comes home to visit his parents from a nearby town by train. When I saw the shot of a commuter train going past on screen, it flashed upon my mind the image in Ozu’s works. That is one of the Japanese director’s signature shots, a train passing through, and his favourite subjects also being family, marriage, nuanced interactions. I thought, if Ozu were an Englishman living today, this would be the kind of films he would make. And lo and behold, I found this tidbit of trivia on IMDb: One of Mike Leigh’s top 10 films of all time is Tokyo Story (1953). If one is to find fault with Another Year, it could be the very fact that Tom and Gerri’s marriage is just too perfect. But with all the ubiquitous dysfunctional families we see represented in movies nowadays, Leigh might have opened a window to let in some much needed fresh air. Tom and Gerri make an ideal contrast to what we have so sadly gotten used to seeing in films. There are excellent performances from the veteran actors, but one stands out. Lesley Manville’s animated portrayal of the vulnerable Mary deserves an Oscar nomination. The most impressive shot comes at the end. Without giving it away, let me just say the ending shot lingering on her face and the ultimate fade to black is poignant and most effective. Of course, it’s acceptable to applaud after a festival screening. And so we did, appreciatively, a much needed channel for a cathartic response. Lovely review, and a film I’d like to see. There’s one humorous note for an “oldie” like me. I’m very curious whether Tom and Gerri’s names were chosen as referents to that “idyllic” time in our history – the 1950s. Tom and Jerry parties were a staple of the time. The drink is eggnog-like, and served in a punchbowl, which generally has matching cups. During the Christmas and New Year’s holidays, everyone hauled out their Tom and Jerry sets, and proceeded to socialize. Unlike other kinds of cocktail parties, T&J parties were far more intimate, as people gathered around the punchbowl for quick refills while they were chatting. I just have to believe the gathering at the Tom and Jerry punchbowls and the gathering of the wounded and inept at Tom and Gerri’s table is no accident. It’s as evocative a subtext as I’ve come across in quite some time. Thanks for telling me about this tidbit of Tom and Jerri, the drink that predates the cartoon. It does seem to have a connection to the dinner parties Tom and Gerri extend to their guests. Again, I commend you for your careful reading and extra work in researching and contributing to the post. And yes, this is a movie I’m sure you’ll really enjoy. Excellent review Arti, and that addition re Tom and Jerry (Gerri) from Shoreacres is fascinating. The film opened here last night, and so I listened to my local reviewers on the radio this am. One loved it, the other was disappointed. Her feeling was that it didn’t “go anywhere” and it doesn’t really does it, It just is … but I really enjoyed watching the people, thinking about their lives, hoping they can lift themselves out of where they are. I love your reference to Ozu … hadn’t thought of that but now you mention it there is a similarity. Not quite so stylised but the quiet, slow observation of not a lot on the surface but much underneath is very similar. I too liked the way the garden framed the story – added a structural element to connect the narrative, the realistic element in showing the couple’s close and comfortable relationship, but also, as you say that whole metaphoric element regarding nurturing. My negative reviewer felt the characters were too exaggerated for her, and commented on the negative attitude to singleness (but I think it was too particular – despite the universals about human behaviour – to be quite making that point). Oh, the Imelda Staunton cameo was great too … thought I was sorry we didn’t see more of her. If the ‘negative commentator’ thinks the film isn’t ‘going anywhere’, that’s exactly the point. One of the main reasons I enjoy indie films is that they don’t need to go by a Hollywood style story arc, with the formulaic three-part structure: a beginning, middle, and a nicely resolved ending. The title itself is a hint of what to expect. For many people, each year passes without a solution to conflicts, leaving them still pining for deliverance. That’s exactly how I see Mary and Ken in the film… the ending is poignant just because Mary is left there at the dinner table, spiralled further down the hole of helplessness. That’s a more realistic depiction of life than Poppy in Happy Go Lucky I’m afraid. Thanks for sharing your view! Well it didn’t take me too much time to download the movie and to watch it, after your recommendation of course, and I very much thank you for that. I too felt the happy couple a bit exaggerated, but as you write, why not? Whether this helps draw out the characters of Mary, Ken and Ronnie’s family is not debatable, but I still say, why not giving viewers the chance of seeing a happy family, where things are going well for them and their son. There are so many dysfunctional characters in movies and books these days, you start to wonder whether normal still is normal. Lesley Manville is a phenomenon. Wasn’t she also in Secrets and Lies? I think I’m developing a little crush on Mike Leigh’s films, saw Naked as well, and imo it is one of the most beautiful films I ever saw. Great film and Mike Leigh is one of my favourite directors. Check the article we wrote to celebrate both the director and our 10th Anniversary. Very charming review. I just watched that film, I actually stumbled upon it, and was captured by its lovely tone. Warmth is all about; I especially enjoyed the later scenes with Mary and Ronnie. They seemed so tranquil, which was rather pleasing. I agree with you that Tom and Gerri’s marriage seems too good to be true, but such things do happen. Thanks for stopping by Ripple Effects and leaving your comment. At the Toronto Int. Film Festival this past week, Mike Leigh has a new film Mr. Turner. I didn’t watch it at he Festival, thinking most likely it will come to our local theatres in the next few months. Hope to hear from you again.